As for sustainability concerns, the weather—or more accurately, the growing extremes of climate change—hit a high mark in 2017 (see articles in News section). And the theme seems to be carrying over into 2018, marked this time by extremes in frigid temperatures, along with freezing rain, sleet, and snowfall. Sections of California have experienced a double whammy, first with record-breaking fires, and now with record-breaking rainfall that’s resulted in flooded areas, followed by mudslides that covered roadways, homes, and led to a number of deaths and missing persons. What’s next? Most probably, this decade marks a no-turning-around point in reversing the ongoing onslaught of Nature’s revenge. Either we learn how to mitigate the potential dangers ahead, or be forced into adapting as best we can, a tactic already underway. One thing’s for certain: No longer can ill-informed deniers and naysayers continue to impede attempts at having intelligent conversations about such a vital issue. Passionate, progressive-inclined citizens demanding adherence to scientific facts and practical, humane solutions must overpower extreme, irrational, and scientifically unsubstantiated views. And solutions do exist. The only problem is convincing more world citizens of the urgency involved—if we wish to avoid an Armageddon-style future collapse of civilization. Last July, NPR reported on a study from Lund University in Sweden showing the most effective strategy in drastically reducing carbon emissions and slowing climate change is to make four significant lifestyle changes, in this order of impact: 1) having one fewer child (an average for developed countries of 58.6 metric ton CO2-equivalent or tCO2e emission reductions per year; 2) living car-free (2.4 tCO2e saved per year); 3) avoiding airplane travel (1.6 tCO2e saved per round trip trans-Atlantic flight); and 4) eating a plant-based diet (0.8 tCO2e saved per year). If these four lifestyle changes appear too severe, we can easily pay attention to: 1) reducing the use of all natural resources, by minimizing personal auto and air travel, consuming fewer unnecessary goods (including meat), using less water, and so on; 2) reusing as many items as possible for as long as possible; and 3) recycling all useful things, including material goods, water, and food and yard waste via composting. [See also Tegan Tallulah’s article, the first in the Solutions section, for more suggestions]. Beyond the individual efforts taken in our homes, we can also encourage our neighbors and communities to actively support local reduce-reuse-recycle programs, including the collection of food and lawn waste for composting. For certain, putting the brakes on climate change will require all world citizens taking constructive action in their local communities. Finally, anyone who lives in St. Anthony Village is warmly invited to participate in activities sponsored by Citizens for Sustainability, a group seeking to implement measures that improve our community’s efforts at reducing, reusing, and recycling as much as possible—and also developing a city-wide composting program. > CASSE: Nature Needs Half – And Twice The Steady Statesmanship (Brian Czech). Nature needs half of the planet to maintain a highly functional system of plants, animals, and their habitats. And we need such a functional ecosystem to support our own species. Nature is our habitat. No nature means no economy, no national security, and no international stability. For what it’s worth, we may as well spell it out: Leaving a “little bit”—and Trump proposes—is the surest bet for destroying the greatest number of businesses for the longest period of time. The fact is the economy needs nature, nature needs half and twice the steady statesmanship. > Common Dreams: How Inequality Is Killing Off Humanity (Paul Buchheit). There is ample evidence for a growing inability of people around the world to maintain the basic human needs of physical health and mental stability and a living wage and a desire to live in peace. The richest .01% are wealth-obese, and inequality is made worse with tax havens and tax breaks and tax deferrals. The poor remain uninformed, while the rich plan for Armageddon. The ultimate destinies of desperately unequal societies throughout history are not pretty: wars, revolutions, state collapses, and catastrophic plagues. > Minnpost: Can Hunger Really Be Falling Around The World? Unfortunately, The Stats Say No (Ron Meador). Nick Kristof’s posting “Why 2017 Was the Best Year in Human History seems misleading. Plentiful evidence suggests that, given the current combination of global population growth and rising living standards, today’s declines in world hunger are likely to outlast the gains. The environmental impact of our species is often calculated conceptually as I=PAT (Impact = Population x Affluence x Technology (industrialization). To reduce “overshoot”, we need to restore the balance between resource consumption and resource renewal. > Peak Prosperity: Drowning In The Money River (Adam Taggart). Simply put: our highly financialized economy is gamed to enrich those who run it, at the expense of everybody else (the 99%). The “money river” ($13+ trillion in new thin-air money) is the huge tsunami of investment capital sloshing around the globe, birthed by the historically unprecedented money printing conducted by the world’s central banks over the past decade, more than tripling their collective balance sheet since 2008. What this has resulted in is a tremendous transfer of wealth to the rich at the expense of everybody else. > Peak Prosperity: Gail Tverberg: The Coming Energy Depression (Adam Taggart with Gail Tverberg; podcast and transcript). For energy analyst and professional actuary Gail Tverberg the global energy outlook is grim. To her, it’s a simple math problem. Too many people are placing too much demand on the world’s depleting energy resources. The cost of energy is rising (as is the cost of living), which we are compensating for in the short term by using financial gimmicks to make “affordable”—when all we’re really doing is creating future promises that cannot possibly be repaid. This path leads to another Great Depression-style crisis from which she does not see a clear escape path. > ABC News: 19 Dead, Others Missing After Flooding And Mudslides Force Thousands To Flee In California Max Golembo , Matt Gutman, Daniel Peck). The rainfall rate in Southern California recently was 18 times more than required to produce debris flow. Montecito experienced heavy rainfall in a short amount of time, 3-5 inches in places. Because hundreds of thousands of acres were charred, rainwater flowed freely, creating mudslides. In Montecito, about 65 single-family homes and another 462 were damaged plus eight commercial structures destroyed and 20 commercial structures damaged. > NOAA: Billion-Dollar Weather And Climate Disasters: Overview (Staff). The National Centers for Environmental Information (NCEI) keeps score of severe weather and climate events in their historical perspective. Found here are the weather and climate events that have had the greatest economic impact from 1980 to 2017. 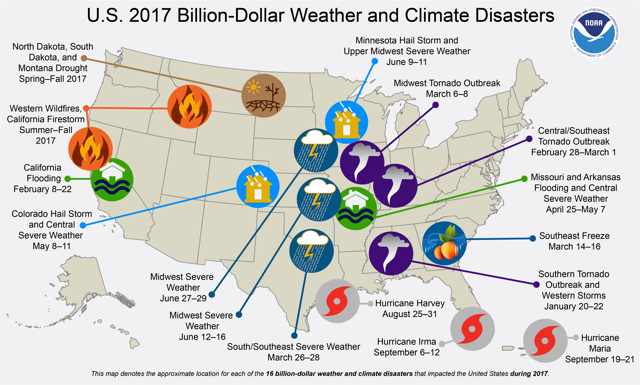 The U.S. has sustained 219 weather and climate disasters since 1980 where overall damages/costs reached or exceeded $1 billion (including CPI adjustment to 2017). The total cost of these 219 events exceeds $1.5 trillion, including the initial cost estimates for Hurricanes Harvey, Irma and Maria. > Huffpost: 2017 Shatters Records With $306 Billion In Damages From Climate-Linked Disasters (Alexander C. Kaufman). The nation’s third-hottest year on record is now officially its costliest for billion-dollar natural disasters. Sixteen major climate- and weather-related catastrophes caused a record $306.2 billion in damages and killed at least 362 people in 2017 as the United States suffered its worst wildfire and hurricane seasons in modern history, according to a report released Monday by the NOAA, Climate change has made weather events more destructive. [See also: 2017 Was A Record-Breaking Year: Climate-Related Disasters Cost The U. S. $300 Billion]. > Grist: Get Used To Saying ‘Bomb Cyclone.’ This Is Our Climate Now. (Eric Holthaus). Wild storms like this past week’s massive coastal cyclone will be part of winters in the Anthropocene. All this atmospheric drama overshadowed two other storms underway at the same time. A sprawling cyclone even stronger than the “bomb cyclone” plowed through Alaska, where the ocean should be covered in ice this time of year. In Europe, a powerful ocean storm made landfall in the British Isles. Given what’s at stake climate wise, denials’ views should be seen as a threat to our safety, just as real as any bomb. > NRDC-On Earth: America Needs A Plastics Intervention. Now’s The Time. (Jeff Turrentine). According to one recent study, of the 6.3 billion metric tons of plastic waste generated worldwide since 1950, only about 9% has been recycled, the rest is trashed and ultimately ends up in our landfills or oceans. In past years, nearly one-third of the recyclable plastic in North America went to China for processing, but as of January 1, China has stopped accepting shipments. What’s called for now is a second industrial revolution in which speed and efficiency, the motors of the first industrial revolution, are replaced by a dedication to sustainability and social responsibility. > The Climate Lemon: Individual Vs Collective: Are You Responsible For Fixing Climate Change? (Tegan Tallulah). We all need to take responsibility for climate change and take action in our own lives. Climate change is a big problem, but we can solve it by all doing our bit for the planet, by making small everyday choices to be more sustainable and low-carbon, and we should all try to do more. In the end, it does come back to ordinary individual people like you and me. The people in charge rarely change things unless pushed to by the masses. > Common Dreams: ‘Going Outside Traditional Media,’ Sanders To Stream National ‘Medicare For All’ Town Hall With Digital Outlets (Jessica Corbett). Sen. Bernie Sanders (I-Vt.) announced Thursday that he is partnering with three digital media outlets “to do what cable channels and network news will not”—host the first-ever national “Medicare for All” town hall to “engage in an in-depth conversation about one of the issues that matter most to Americans, their healthcare.” The D.C. event is open to the public and will be streamed live across Sanders’ social media channels as well as the three online outlets. > Resilience: Confronting Extremism (Jody Tishmack). A recent conversation with a fundamentalist Christian has left me wondering why it seems we fail to recognize the dangers of extremism? Americans expect Muslims to call out radical Islamic extremists, but we seem unable or unwilling to do the same in the case of Christian extremists. Christians who deny the reality of climate change, who believe that humans have a God-given right to exploit the earth no matter the consequences pose a danger to society. I think it’s time we talk about that. > Local Futures: Farming For A Small Planet (Frances Moore Lappé). Large-scale farming operations rely on corporate-supplied chemical inputs that deplete soil and nutrients, contributes 20 percent of all anthropogenic greenhouse gas emissions, and it feeds the very root of hunger itself: the concentration of social power. There is ample evidence that organic agriculture, or more broadly “agroecology”, is actually the only way to ensure that all people have access to sufficient, healthful food. Agroecology also bolsters farmers’ confidence and dignity, and enhances local economies. > Clean Energy Resource Teams: Is Home Weatherization On Your List Of New Year’s Resolutions? (Dan Theide). Several things should be included in a home energy audit:1)A review of energy bills; 2) A blower-door test to determine air leakage; 3) Infrared scans of walls, attic, and foundation to assess insulation levels and locate air leaks; 4) Efficiency and safety testing for combustion appliances to ensure proper operation and safety; and 5) A visual inspection for attic, wall, crawlspace, foundation, basement, window, door, and roof problems. Contact your gas or electric utility to arrange an energy assessment. Xcel Energy offers a $60 Standard Audit that includes the bulleted items above. > Citizen’s Climate Lobby: Regular Meetings And Events (www.citizensclimatelobby-mn.org); Meetings in 18 MN locations on the 2nd Saturday of each month to focus on bi-partisan Carbon Fee and Dividend Legislation; 62 members of the US House on the Climate Solutions Caucus are involved.